The arium® mini Is Designed for a Water Requirement of Less Than 10 Liters per Day. Request A Free Quote and see how the arium® mini will transform your lab experience. The arium® ultrapure water series offers an exceptionally wide range of modular-designed systems for producing Type I ultrapure water. To suit your individual ultrapure water requirements, you can choose between three model versions, the arium mini, mini essential, and the arium pro. Delivers consistently high water quality for reliable and reproducible results; optionally available with UV lamp. Depending on the model type, with unique bagtank technology to save you from the hassle of time-consuming tank cleaning. Touch-activated color display with direct access to all important dispensing options. Space-saving footprint with width of 28 cm easily fits any lab environment. Originally developed for the pharmaceutical industry, our single-use bag integrated as a tank system on the side of arium® mini protects intermediately stored pure water reliably from secondary contamination. The 5-liter bag, consisting of our specially manufactured proprietary S71 film material, is multilayer and compliant with ISO and USP standards for biocompatibility. With the quality and composition of the arium® Bag, you can optimally store your pretreated pure water for later production of Type 1 ultrapure water. Compared with conventional tanks the disposable arium® Bag is easy to exchange in less than 5 minutes, enabling you to easily renew your storage tank. This eliminates not only time-intensive cleaning, but also hazardous sanitization. Moreover, the arium® Bag integrated on the side reliably prevents secondary contamination of your purified water, ensuring constant water quality for the long term. With intelligent technology, the arium® mini ensures continuous protection against secondary contamination and therefore the highest water quality at all times. The closed bagtank system automatically regulates pressure equalization so that no CO2 can penetrate. This additionally prevents contamination by ionic impurities and maintains consistently low conductivity. As an added benefit, you will profit from the especially high cartridge capacity because there is less demand placed on the ion exchangers. Moreover, you can prevent the formation of a permanent biofilm, and therefore eliminate additional TOC loading. Depending on your requirements, you will just need to replace the bag every six months to start off fresh. The new system for laboratories featuring DI water taps. Your laboratory provides a connection that supplies you with pretreated (RO | DI | EDI) water? 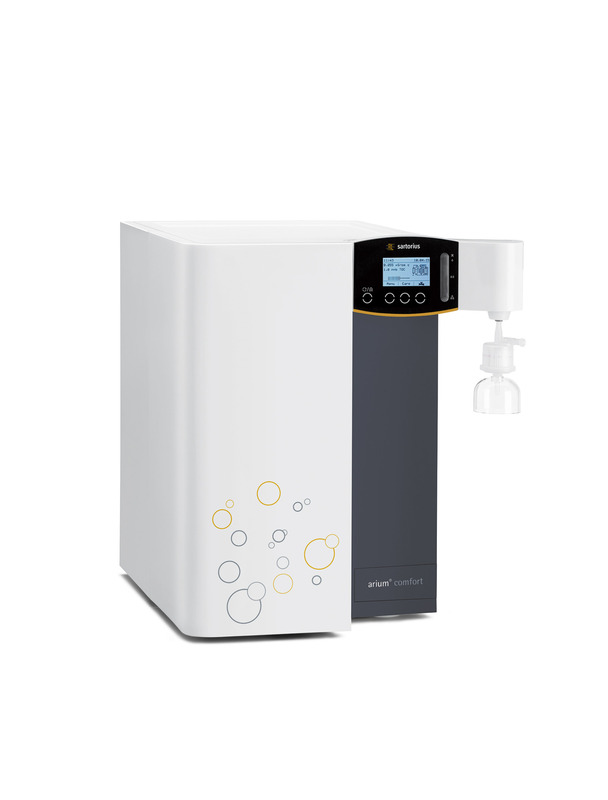 Then you best meet your daily requirements for Type 1 ultrapure water with the new arium® mini essential. This space-saving system will be directly connected to the on-site DI water line of your lab and thereby manages completely without storage tanks for intermediate storage. The directly supplied DI feed water will be immediately subjected to the ultrapure water purification process. Final filtration through 0.2 μm sterile filters for critical applications requiring bacteria-free water. Features a favorites function for repeated dispensing of identical volumes. Continuous water dispensing using the slider - easy to control even with gloves. Easy and secure; PIN-protected administrator rights optional. Focuses on the most important values and displays all major quality parameters. Pre-programmed service contacts for fast support. Continuous measurement of purified water quality to ensure reproducible results. Maximum cartridge capacity thanks to efficient ion exchange resins combined with high-quality activated carbon for optimal removal of organic and inorganic impurities. Integrated ultrafilter for continuous and effective removal of endotoxins, RNases DNases, microorganisms and particles. Reliable removal of organic components by UV oxidation (185 |254 nm) down to < 2 ppb. The arium® pro Type 1 ultrapure water systems inspire with their practical, application-oriented design that will make your daily lab work easier. 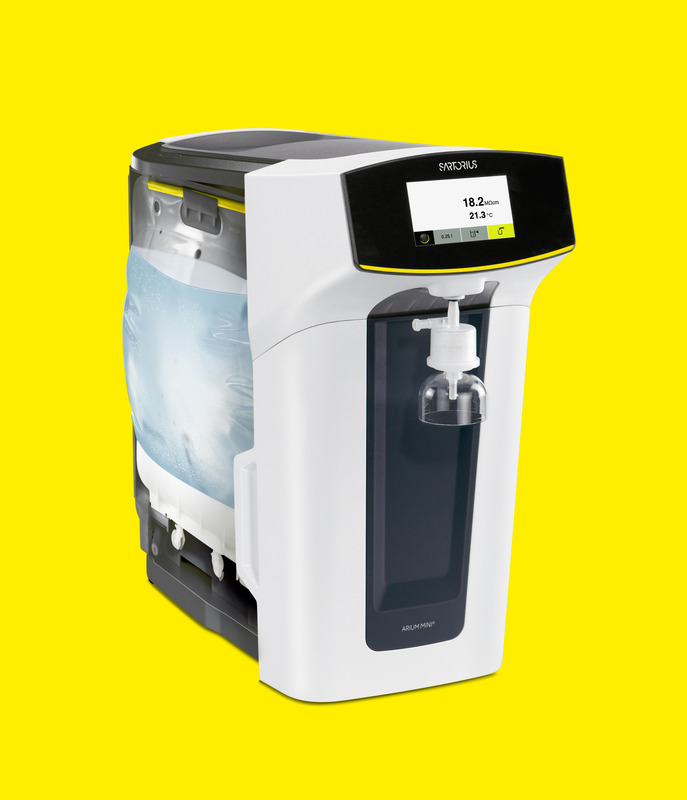 They deliver up to 2 liters per minute of consistently high-quality Type 1 water with 0.055 μS/cm, ensuring the best reproducible results. The arium® pro series offers you the widest selection of application-oriented systems for optimum adaptation to your specific needs. Sartorius gives you a flexible choice of options so you can select what's best for your application, such as an integrated ultrafilter for bioapplications and a UV lamp for analytical applications. These will not only save you money, but will also optimize the quality of your results. Particularly for your analytical applications, the system can also be equipped with a TOC monitor. This calibrated unit ensures constant, reliable monitoring of TOC levels.